MKR couple applied for the show as 'part of a prank'. My Kitchen Rules couple Matt and Aly are only on the show because a joke went 'too far'. Have you ever been watching a reality TV show, looked across at your boyfriend/girlfriend/best friend/dog and thought, ‘We could totally be on this show and win’? Perhaps it was during an episode of Masterchef, after the 150th croquembouche challenge, and you remembered the time you made brownies out of a packet mix and only burnt one edge. ‘How hard could it be?’ you asked yourself. Maybe you were watching The Block and remembered that time you made a paper towel holder in your year nine woodworking class and scored a solid B+. ‘I can renovate an entire mansion, easy!’ you said. Or perhaps you were watching a Bachelor rose ceremony and chuckled to yourself as you imagined filling out an application for the next series on behalf of your friend who most definitely would never want to go on The Bachelor. LISTEN: Monique Bowley thinks Masterchef’s judging panel is a sausagefest. Does the show need some more female perspectives? The Mamamia Out Loud team discuss. We’ve all had those moments. The thing is, most of us never act on these…. thoughts. 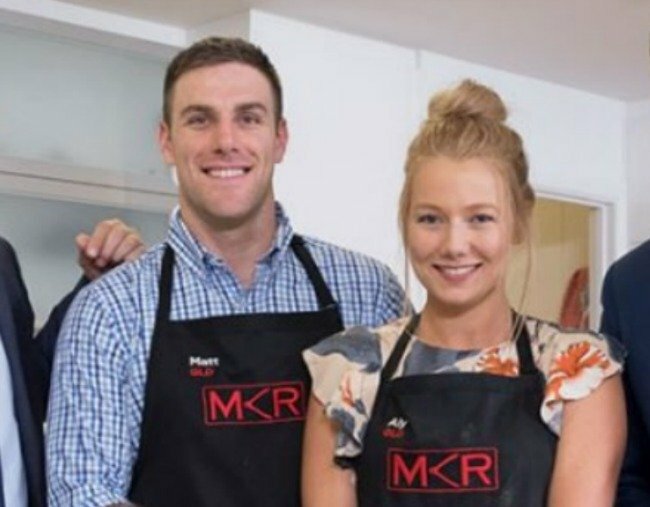 Unless, of course, you are My Kitchen Rules couple Matt and Aly, who recently revealed they applied for the cooking-show-that’s-actually-only-one-per-cent-about-cooking as a COMPLETE AND UTTER JOKE. 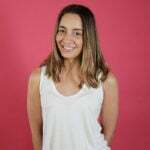 Speaking to News Corp Australia, 26-year-old Matt, from Brisbane, said he submitted an application for the show as part of a prank on his girlfriend, Aly. When producers contacted him in regards to moving on to the next step of auditions, Matt decided things had gone “too far”. “They asked us to submit a video of us cooking and I was like, ‘Oh, no, this is too much ­effort, prank’s gone too far’, so we never actually submitted that,” he said. A week later, the pair were asked to provide a photo and lo and behold, they made it onto the show. MKR&apos;s Matt and Aly applied for the show as a joke. Image via Channel 7. But that&apos;s not the only surprise about the couple&apos;s time on the Channel 7 reality show: Aly learned she was pregnant with their first child on the very first day of filming, which saw her unable to taste many of the other contestant&apos;s dishes which contained alcohol. It seems the pair&apos;s "experimental" cooking style isn&apos;t going down so well with the judges, with the couple sliding to the bottom of the leaderboard this week after a disastrous pulled pork dish which was slammed by viewers and fellow contestants for containing pineapple. "Unfortunately I&apos;m going to be quite harsh on this critique... I&apos;m very, very disappointed, you haven&apos;t taken me to Mexico," judge Manu Feildel said of the dish. "The pork is dry, it&apos;s unseasoned, and the salsa, pineapple doesn&apos;t exist in Mexican cuisine - it&apos;s a very Aussie thing to do. I really haven&apos;t enjoyed this."